Over the past few months, I’ve really found myself craving soup. I’ve always been okay with soups, they were just never my favorite. But when I started working from home, it was an easy solution for lunch. The other day I came across a list of 100 Healthy Soup Recipes on the Cooking Light website. I clicked through them all and bookmarked over 30 soups that I really want to try. My goal is to make a soup a week and I’ve decided to share the ones that I really like with you! 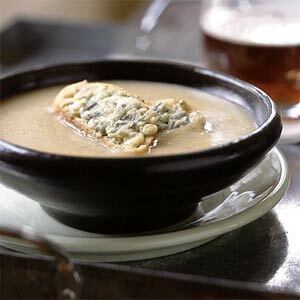 Last night I made a Roasted Garlic and Shallot Potato Soup with Cheesy Croutons (pictured above). OH EMM GEE. It was very, very good. I tend to prefer creamier soups like this one, but what’s so great about it is that you only use a little bit of milk – it’s mostly a broth based soup. The creamy texture comes from pureeing the roasted garlic and shallots and the potatoes. When I make it again, I think I’ll find a way to keep the potatoes out of the blender because I do like that kind of texture in a soup. It was a great first soup to make and if you are a garlic lover (vampires, beware) I suggest you give it a try! Check out my competition in Christmas cards and wedding invitations at Minted.